No more like the brick built rahi we've already talked about, since a large amount of the G3 plan is based around the idea of them anyway. Bionicle was Lego's largest, longest running theme, which, like Minecraft, is based around worldbuilding. Seems like a pretty fair comparison to me. And what stops the Makuta from taking control of the rahi? Bionicle was Leo's largest, longest running theme, which, like Minecraft, is based around worldbuilding. Seems like a pretty fair comparison to me. Minecraft, is an insanely popular game now, bionicle is effectively starting from zero. Also, different kind of world building. I mean, the rahi are the first arc, and there's no real reason to add mounts in the first arc. I would imagine that this would take place after Makuta's control over the rahi had been broken. it might be a bit too early to have this conversation, since as I've noticed already, there isn't really a good foundation to argue off of. We know so little about "G3" and I personally feel it might be a good idea too hold back the debates until we know what "G3" actually is. Bionicle is an action theme, action themes need action sets, if you give Makuta control over the rahi then the toa need something that can match them that can't be controlled by the Makuta, as a modern Lego line, the heroes need something. I mean, the rahi are the first arc, and there's no real reason to add mounts in the first arc. It's a modern action line, I'm approaching this as a real theme, there needs to be good guy sets that are interesting and have 'swooshability' in order for it to succeed, that's just the reality of the situation. It's like, if you had ninjago or nexo knights, and you took away all the hero vehicles, do you honestly think they'd be near as successful as they are? I'm Ninjago's first year there were no hero vehicles. All of the vehicles belonged to the bad guys, the ninja were all in their own. The dragons weren't even in their side initially. I'm simply suggesting that the same applies to year one of Bionicle. The hero's don't get help until later. What you do with a toy plane, swoosh it, kids like to swoosh their action toys. Therefore they need swooshability. Honestly I don't even remember the set line up of the first year. The sets were sold as good guy sets, I remember that much. I'm simply suggesting that the same applies to year one of Bionicle. The hero's don't get help until later. So have the minifig toa fight brick built rahi for the first year, most likely mounted by the brotherhood. Then the rahkshi, I'd argue they shouldn't be minifig sized, after massive brick built rahi it feels like a significant downgrade, as well, I doubt they'll be riding anything, so action set potential is kinda low with the main villains being minifigs, and, how will the toa defeat the rahkshi? I argue an upgrade of some sort, I'd have the toa find the kaita machines, for the sake of having sets in the second year, either the we get brick built rahkshi, more rahi and/or we get the kaita mechs. I'm sure you're fine with structures, but kids aren't, you need some sets kids can swoosh along with the scenery. Kaita don't work with minifigs at all, even if they're completely different figures that aren't the combination of the Toa. If you can't put them together from the Toa, you lose the purpose of Kaita in my opinion. You could build them up, mech style, and put the minifig heads on top. I know, but that would eliminate their main purpose of being actually made out of the Toa figures I think. I personaly think that the Kaita as the combined form of the toa should be dropped. If we are going to have the two Kaita in the story, then i think they would most likely work better as beings of legends and not being prior toa or combined ones ither. No they weren't, they were all sold as "Dragon fight" sets with the good guys fighting the dragons. What's this about mounting? I said nothing of the Brotherhood mounting the rahi. Ninjago had dragons in the first year and then went to minifigure sized snakemen, size isn't everything. how will the toa defeat the rahkshi? We are far too preliminary for me to argue this. I could direct you to my pitch topic, but there is nothing official about It, so this is a moot point. You seem to be assuming that these structures are just hunks of bricks like a architecture set, obviously the set pieces would have functions and various play features, not everything is dependent on "swooshability." No, they weren't, as far back as the ice dragon they've been ridden by the ninjas in the sets, fighting the bad guys, I don't know where you got this idea from. You've gotta have some bad guy minifigs literally every action line ever has had bad guy minifigures. Ninjago had spooky scary skeletons in the first year, not the dragons. No, don't assume I'm not being fair, obviously the sets that are structures are going to have to have play features to be interesting, but you need sets that aren't structures, even city is mostly vehicles, because kids would rather play with a vehicle more than a tree or a hut, because they can imagine it's flying or driving around, they can swoosh it. If you give a kid two sets that are the same price, one is minifigs and a structure, the other is a vehicle, 9 times out of 10 they'll pick the vehicle. The set is literally called "Ice Dragon Attack" the ice Dragon was the bad guy, don't believe me? Go watch the show, the ninjas fought the dragons before they rode them. The Dino attack lines didn't. That's basically what year one would be, protagonists versus large monsters. No, they'll pick whichever one looks cooler. Whichever one is from the line they like. And most importantly, whichever one their parents are willing to get them. You say nine times out of ten it's going to be a vehicle, but that's only because every line is saturated with vehicles, and the only structure based sets are huge expensive ones like the mummies pyramid, while vehicles are seen across the entire spectrum of sizes. That isn't even close to a fair comparison. More like just ran away screaming from them. Here's Jay's Lightning Dragon; a set I personally own. As you can see, he's fighting the skeletons. 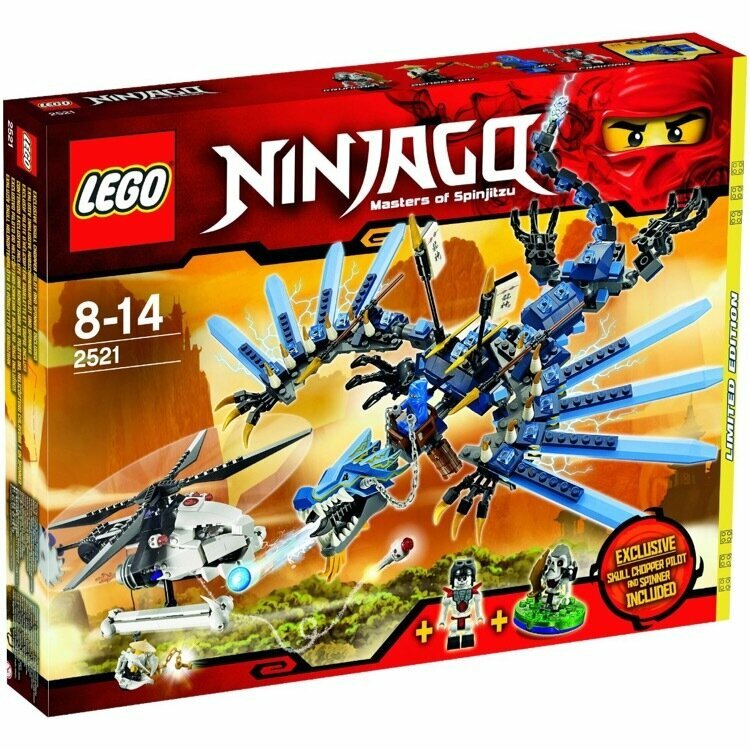 That set still came out at the end of the year, after the ninjas fought the dragons. You think that maybe Lego did this because they sell better? No, I think Lego did it because it's easy and safe and they don't like taking risks, but they have been branching out with Lego Minecraft, And it proves that structure sets can work. And yes, Minecraft is a licensed theme of a game that is wildly popular, but It proovs that there are kids who do enjoy structure sets and aren't all about "swooshability." but they have been branching out with Lego Minecraft, And it proves that structure sets can work. And yes, Minecraft is a licensed theme of a game that is wildly popular, but It proovs that there are kids who do enjoy structure sets and aren't all about "swooshability." It proves that kids like Minecraft and will buy something branded as such.